One of the leading HR & Placement Consultants in Jaipur, Disha Consultant, plays a significant role in Recruitment Services. We are an efficient Recruitment Consultant that provides the best career opportunities to candidates along with providing the best manpower to companies. 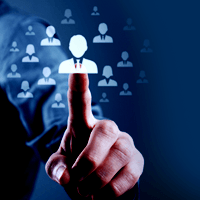 We ensure that the deserving candidate gets his dream job in the dream company. We maintain a huge database of candidates and with the help of advanced methodologies, select the most appropriate candidate for an organization. We as a Recruitment Consultant serve clients with the highest degrees of honesty and commitment.